I’ve been thinking, lately, about the space that food occupies in our lives. There’s a food blog trope about feeding our families and friends being this generous act of nourishing and the motivating force behind many people’s drive to cook (and let’s be honest, most of these people are women). And I don’t doubt that many people find meaning in feeding others, and I do think feeding people is a generally undervalued job in this world (and celebrity cheffing is probably overvalued in this particular cultural moment). But it’s never felt quite honest as an explanation for why I cook. I’ve always cooked for myself. My first forays into cooking as an adolescent were because I was picky eater and wanted to take control of what I was eating. Later, my world and my taste for different flavors expanded, and cooking became a way to participate in culture, to experiment and explore, a creative outlet and a craft for mastery, a self-improvement project I could pour myself into with results I could, almost always, eat. After college, I dove deep into cooking precisely because I didn’t have to. Yeah, I had to eat, but that could be frozen pizza and veggie burgers and takeout (and, even with my burgeoning interest in cooking, it often was those things). It was the early 2000s. I was bored at work and didn’t have the money to go to nice restaurants, but I could escape into the world of Gourmet magazine and Donna Hay and Jamie Oliver cookbooks and this new thing I discovered, a food blog, 101 Cookbooks, that made an aspirational lifestyle feel accessible through my kitchen. I went through a phase of wanting to learn to COOK ALL THE THINGS. Risotto, homemade pasta, bread–oh was there bread–ice cream with exotic flavors, choux pastry and laminated doughs and chocolate truffles. I got more positive feedback for the treats I brought into the office than I did for the work I was doing for actual money. But most of all, it became a way to get used to eating really well pretty much all of the time. Over time, its role in my life has shifted. Cooking remains a passion project and big part of my identity, but as I’ve waded deep into my 30s, I’ve become less interested in impressing people than I once was. I’ve become more interested in bringing people into this wonderful deliciousness that I’ve been mucking about in for so many years. I’ve become intent on showing you (if you don’t already know), that a better world is accessible through your kitchen, too. That it doesn’t have to be onerous or even particularly complicated unless you want it to be. It just takes a bit a care and thoughtfulness and time. 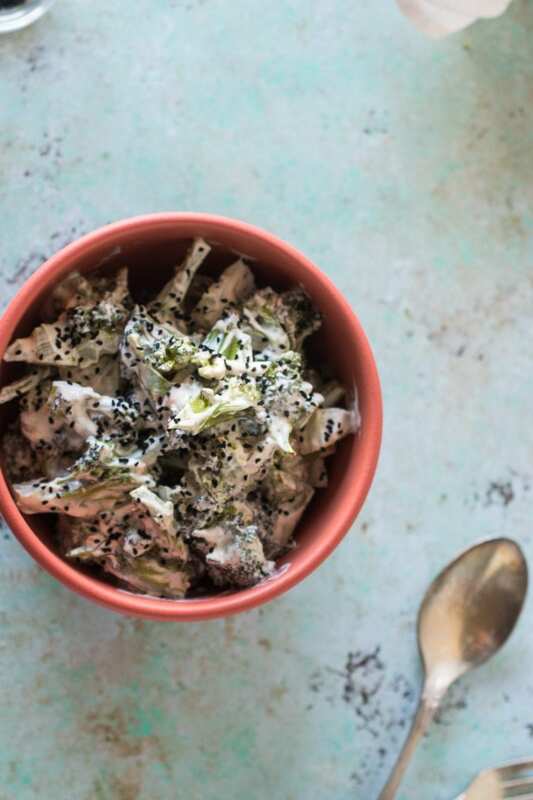 This charred broccoli with harissa yogurt sauce is one of those humble dishes that’s so simple to throw together but that brings deliciousness in a big way. 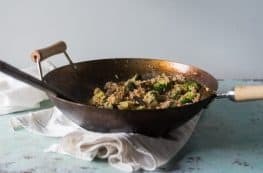 The broccoli gets roasted until it’s deeply caramelized and blackened in spots, which, like with any brassica brings out a sweet nutty flavor. The creamy yogurt sauce gets a shot of heat from the harissa paste. And the whole thing gets an oniony crunch from nigella seeds, which look quite a bit like black sesame seeds but taste, to me, like the punchy topping of an everything bagel. There’s protein here from the Greek yogurt, and I’ve been known to eat this all on its own for lunch, but it’s also wonderful topped with a poached egg or alongside a piece of chicken. It’s a small thing, but a perfect way to bring a little more delicious into your life. 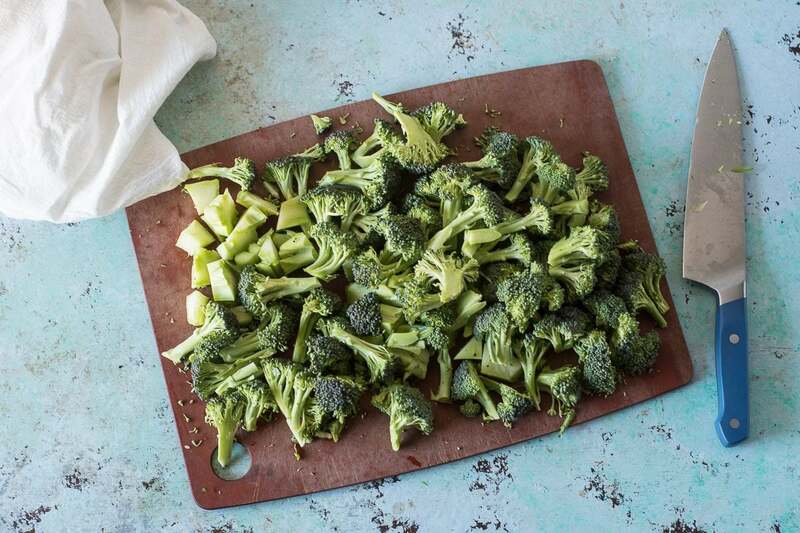 Roasting broccoli brings out a nutty sweetness in the vegetable. I like to roast it until it's deeply charred and blackened in spots. Harissa pastes (a North African or Middle Eastern hot sauce) can vary significantly in heat levels, so I recommend starting small and tasting the yogurt sauce and adding more harissa if you feel like it needs more heat. 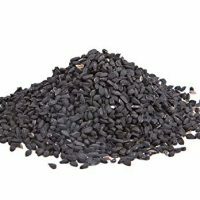 Nigella seeds, sometimes called black onion seeds or black cumin seeds, can be found in Middle Eastern groceries or online. They bring a crunch and an oniony flavor to the dish and I just love them. They're worth hunting down, but if you can't find them, you could add a combination of minced chives and sesame seeds to approximate the textures and flavors they bring to the dish. If you use are really thick Greek yogurt, like Fage, you may want to thin it with a few tablespoons of water. A slightly thinner Greek yogurt, like Wallaby, doesn't need it. This works best with full fat yogurt. I like this as a side or topped with a runny egg for a main. 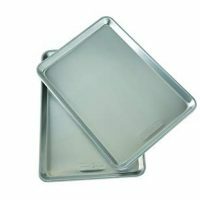 Heat oven to 450°F. 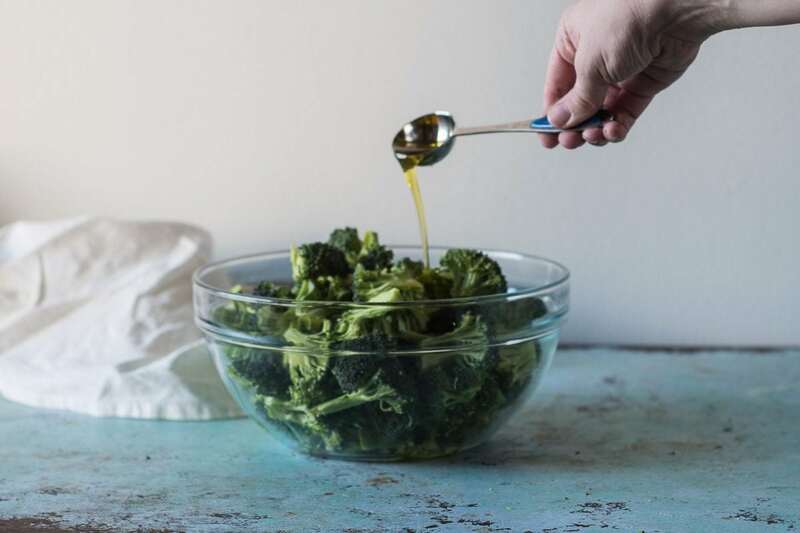 Add the broccoli to a bowl and toss with olive oil and season with salt. Roast until blackened and charred in spots, about 20 minutes. Meanwhile, stir the harissa paste into the yogurt. Taste and add more harissa paste if you want more heat. The sauce will be thick, but you can thin it with a few tablespoons of water if you like. 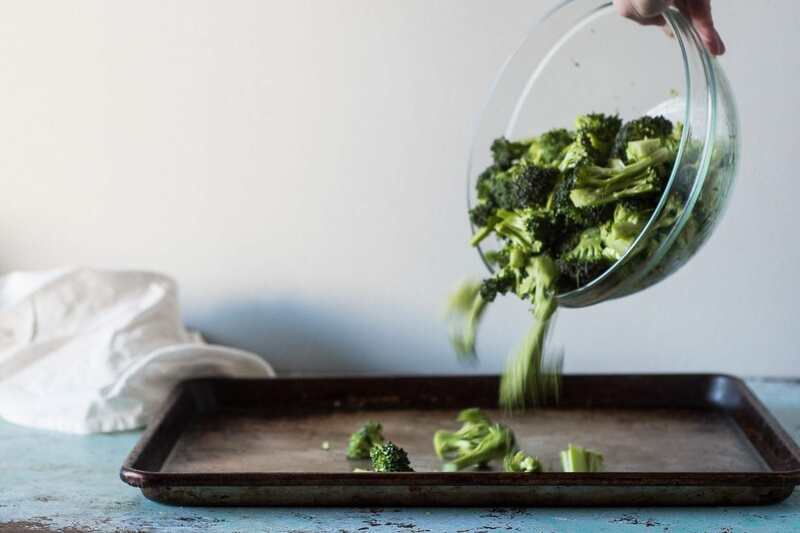 When the broccoli has finished roasting, add it to a large mixing bowl, and add the yogurt sauce and stir to coat. Sprinkle with nigella seeds. Serve. 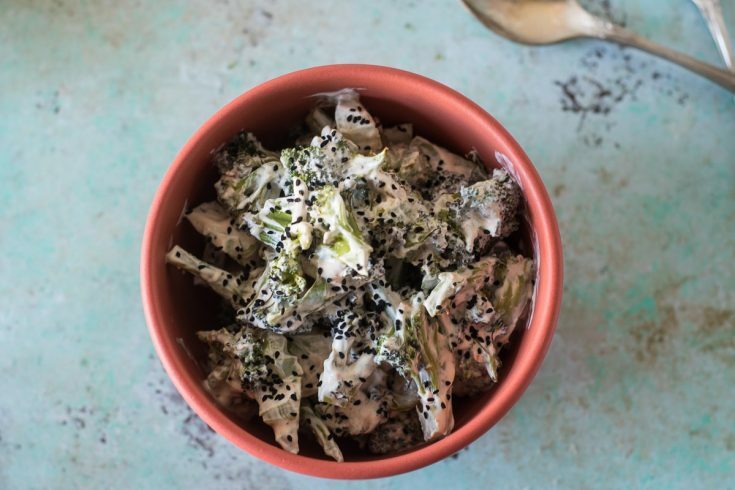 I love broccoli with dressing on it and this looks like it certainly wouldn’t disappoint! I am definitely trying this recipe soon! Thanks for sharing! Luci’s Morsels | fashion. food. frivolity. This looks like my kind of dish! I like that the addition of Nigella seeds. Loos beautiful this way and I am anyway a fan of broccoli and yogurt used together. I could eat broccoli all day, everyday for eternity! Roasting really does take it up a notch. Must try it as you have done here with the yogurt and seeds. YUMMMM! I love roasted veggies especially brocolli. Love what you have done here adding nigella seeds the yogurt and all. I bet it was delist! !